Imagery and remote sensing has always been one of my areas of interest in GIS. As a support analyst at Esri Australia I get a large number of imagery-related questions and I often help clients learn how to process their geospatial imagery and LiDAR data in ArcGIS. Lidar (or Light Detection and Ranging) technology has become very popular and accessible in recent years. Because it provides high resolution elevation data, it’s now extensively used in the GIS world for mapping, spatial analysis and 3D visualization. 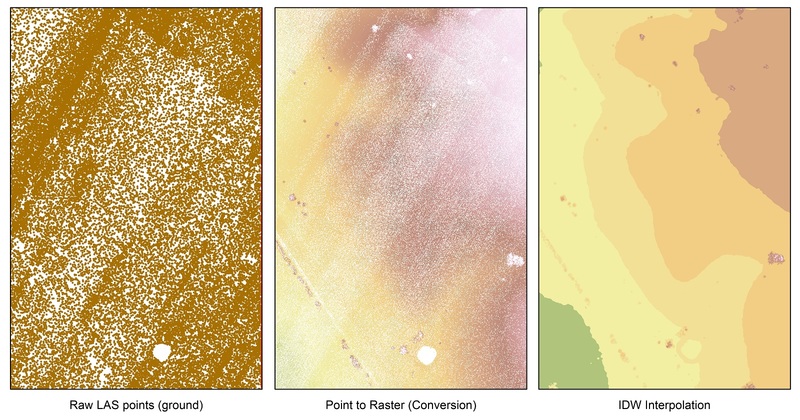 Although Lidar data can be used in many of the ArcGIS Desktop software, it turns out that many users are not aware of some basic workflows that can be utilized to extract raster Digital Elevation Models from their LAS point clouds in ArcGIS. The question “how do I create a DEM from my Lidar data” is one of the most frequently asked questions when it comes to imagery related queries or support incidents. So I decided to prepare a quick overview of tools and methods that you can use to extract raster surfaces from your Lidar (*.las) files. Below, I will outline the methods to extract the DEMs (Digital Elevation Model, also referred to as bare earth) and DSMs (Digital Surface Model, which is the first return surface which contains buildings, tree canopy etc.). Let’s get into it!! Step 2: use the Point to Raster tool to produce an elevation surface. If you want to produce a DEM use only the points that represent the bare earth surface and set the “cell assignment type” to MEAN or MIN. 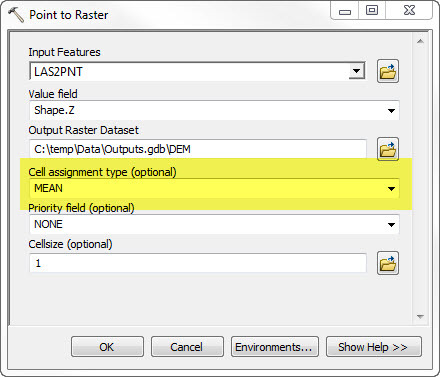 In order to output a DSM, set the “Cell assignment type” to MAX. Although this is the simplest method, it does have its drawbacks. The resulting dataset may contain a lot of NoData pixels, or put simply, gaps in your data caused by the irregular distribution of the bare soil points. This can produce what is known as a “salt and pepper” effect and some post-processing will be required (i.e. Focal Statistics, filtering etc.). There is, fortunately, a secondary approach. 2. 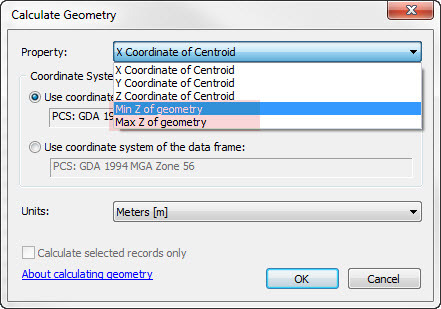 Then, use the Calculate Geometry tool and choose either “Min Z of Geometry” for DEM or the “Max Z of geometry” for DSM. 3. Lastly, use one of the interpolation tools from the Interpolation toolset. In the example below I used the IDW interpolation tool. 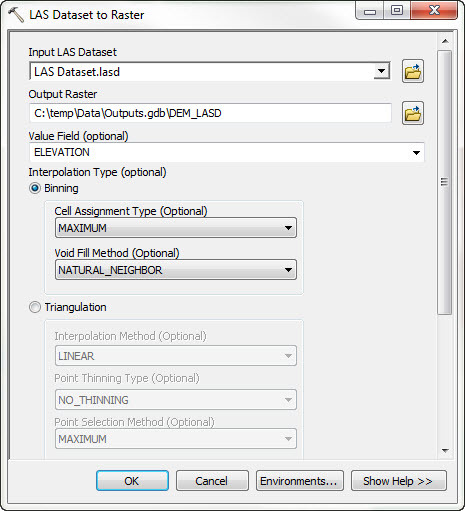 Step 1: Use the LAS to Multipoint (3D Analyst) tool and save the output in a Feature Dataset in a File Geodatabase. Step 2: Then, create a terrain dataset using the Create Terrain (3D Analyst) tool. Step 3. Once that’s done, use the Terrain to Raster (3D analyst tool) to produce either a DSM or a DEM. This method is available in ArcGIS Desktop 10.1 and 10.2 and it uses Lidar Datasets that you can create to manage large collections of *.las files. LAS Datasets were recently introduced in the ArcGIS software suite as an industry-standard binary format for storing airborne lidar data. A LAS Dataset stores references to one or more Lidar files on disk and serves as an organisational unit for large collections of lidar data. In addition to this it is also used throughout the ArcGIS for Desktop software suite for visualization and analysis. Step 1. Create a LAS Dataset and add *.las files. – Right-click on any folder in the Catalog Window in ArcMap, choose New > LAS Dataset. Add a name. 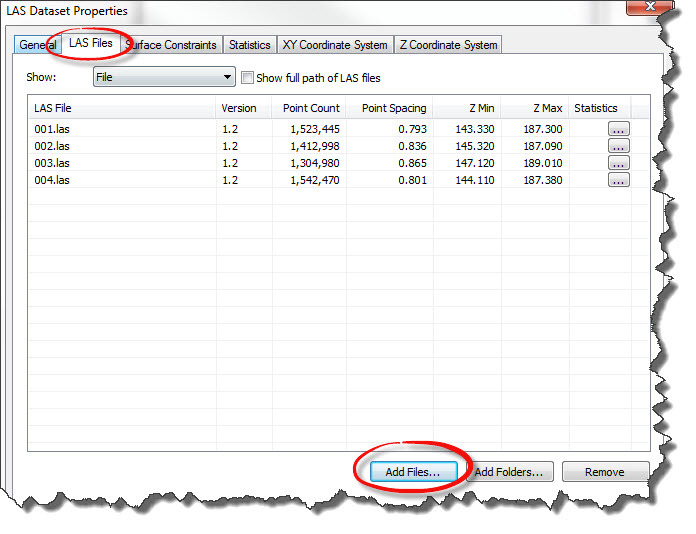 – Navigate to the LAS Files tab > hit Add Files and add you Lidar files. – Make sure that the vertical and horizontal coordinate systems are set correctly. If the LAS files don’t contain any information about the coordinate system you will need to specify it manually. Step 2: Add the LAS Dataset to ArcMap. 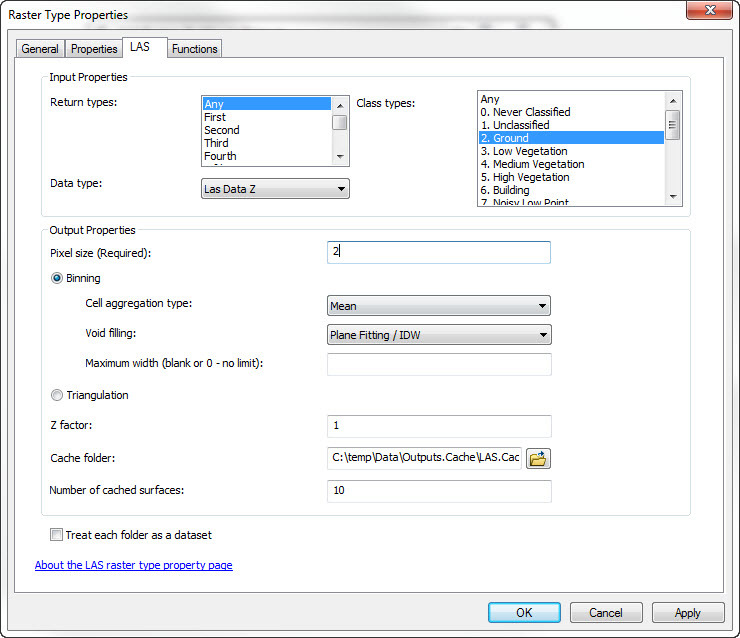 In ArcGIS 10.1/10.2 you can generate Lidar-derived products on the fly using the LAS Dataset toolbar. Step 3. If you still need to generate a DEM or DSM in the form of a raster dataset on disk then use the LAS Dataset to Raster (conversion) tool. Depending on what type of surface you want to generate, select either Average (DEM) or MAXIMUM (DSM) for the Cell Assignment Type parameter. Method #4. Use mosaic datasets. Both Lidar files (*.LAS) and Lidar Datasets are listed as raster formats supported by mosaics datasets in a file geodatabase. You can use on-the-fly processing to your advantage and optimize the storage and usage of your Lidar file collections by adding them to mosaic datasets in either a File geodatabase or an Enterprise geodatabase. Consider the following simple workflow of adding LAS files to a mosaic dataset in a file geodatabase. Step 1. Create a new file geodatabase and a new mosaic dataset. 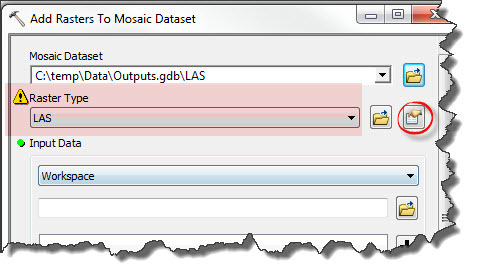 – Use the Create Mosaic dataset (Data Management) tool. Make sure that your mosaic dataset is using the same coordinate system as the input Lidar datasets. Step 2. Add Lidar files (*.las) to the mosaic dataset. – Right-click on the mosaic dataset in the Catalog window and choose Add Rasters. – Navigate to the LAS tab and set the parameters. Choose return, class and pixel size (try to use pixel size approx. three times greater than the average point spacing). Step 3: Display the resulting mosaic dataset in ArcMap, then define and build the overviews. You can also optimize the performance of a mosaic dataset referencing Lidar data by building a mosaic dataset’s own cache prior to building overviews and pyramids. This is considered to be best practice for mosaic datasets that reference large collections of LAS files (*.LAS) or LAS Datasets (*.LASD). 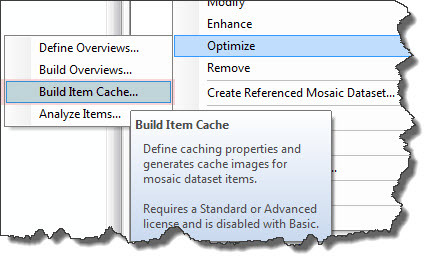 The mosaic dataset’s item cache must be generated BEFORE the overviews for the mosaic datasets are defined and generated. This will allow you to utilize the LAS to Raster Function (basically to build a raster from LAS files) before you produce the overviews for your mosaic dataset. Step 4. After you’ve generated overviews you can use this mosaic dataset as an elevation source in geoprocessing tools as well as for visualization. I hope this information was useful to you. If you have a different workflow for generating DEMs or DSMs from LAS files in ArcGIS for Desktop, please feel free to share them below (in the comments). Oh, one more thing which I almost forgot: please have a look at the 3D GIS resource center http://resources.arcgis.com/en/communities/3d/. The gallery contains a lot of free tools and geoprocessing models which will facilitate the process of using LIDAR data in your GIS environment. Have fun with Lidar data! This entry was posted in General and tagged ArcGIS for Desktop, Imagery, Lidar on May 15, 2014 by Ivan E..